“We surface court statements, investigations, including from the FBI, and previous statements that clearly conflict with the accusations and information presented in the HBO documentary,” says Tiffany, a US fan who posts under the name @RideTheBoogie. 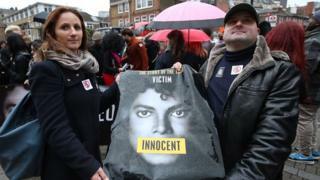 The movement to clear Jackson’s name has existed since he was first accused of molestation in 1993 (the case was later settled out of court for $23m), but it has become increasingly vocal since Leaving Neverland was announced in January. Going back further, fans highlight Jackson’s acquittal on child abuse charges in 2005; and direct sceptics to unsealed FBI reports on the star, dating from 1993-4 and 2004-5, which found no evidence of criminal wrongdoing.